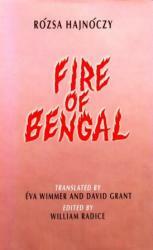 Fire of Bengal plunges us into the midst of life in Rabindranath Tagore’s Santiniketan during the late 1920s. Rozsa Hajnoczy, wife of a Hungarian professor, kept a journal of her impression during their three years stay at the ashram. 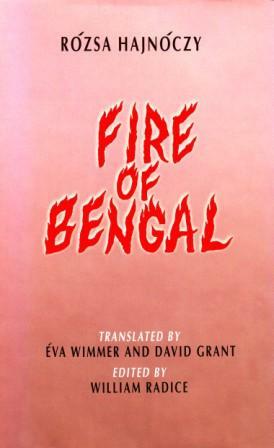 After her death in 1942 this was published in Budapest and became one of the classics of modern Hungarian literature. For through Rozsa’s clear yet compassionate eye we witness Tagore’s ‘heaven of peace’ beg torn apart by the tensions that were shaking the foundations of the Raj, by subversion and riot among students and staff, and by the ill-fated East-West marriage between Atany Ray, a professor of English, and his European wife, Himjhuri. For these dramatic events Rozsa Hajnoczy provides a kaleidoscopic background of temples, places, harems and hovels, of mountain, jungle and plain, of princes and beggars, of holy men and revolutionaries. All this, and the portraits of Tagore, Gandhi, and the cosmopolitan characters on the campus, surely contains much that will be a revelation even to those who remember those times.